We are excited to be participating in the Hour of Code with our Room 4 children t his year. On Friday, we will run an hour of simple exercises with the children where they can begin to understand computer science, solve puzzles and create games. Each child will be given a certificate to recognise their efforts. 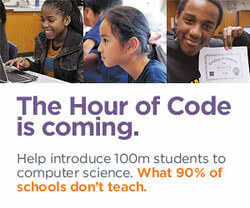 The Hour of Code is an international event running in over 180 countries worldwide. It involves a one-hour introduction to computer science, designed to demystify code and show that anybody can learn the basics.